To be 100 percent honest, I’m not the most fervent eggplant fan in the world. But this recipe is incredibly delicious. The caramelized onion creates a sweet, balanced flavor. Works well as a dip with warm pita, vegetables and corn chips, or as a spread on bagels, sandwiches and more! While veggies are roasting, add 2 tablespoons of the olive oil to a large skillet set to medium-high. Add onion, and stir occasionally, until soft and caramelized. About halfway through cooking the onion, toss in the garlic slices. 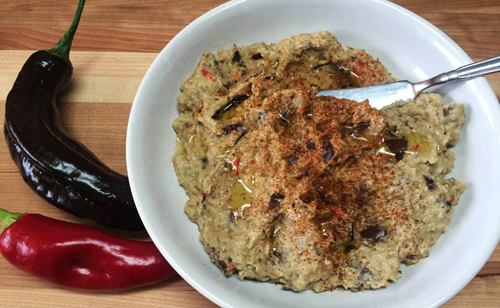 Add roasted eggplant and peppers, along with the garlic and caramelized onion, to a food processor. Add the tahini, lemon juice, salt, pepper, and 1 tablespoon of olive oil. Blend well, stopping every now and then to scrape the sides of the processor with a spatula. When well-blended, add to a serving dish. Drizzle with the final tablespoon of olive oil and add a sprinkle of paprika. Best served warm, but can be stored in the fridge for a few days, too.